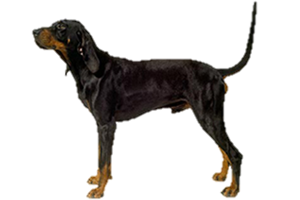 The Black and Tan Coonhound is a treeing dog, meaning it was developed to track it's prey and then force the animal into a tree. Once it is treed the dog will continue to bark or bay until the hunter makes the kill or the dog is called off. The Black and Tan Coonhound's primary prey is raccoon, although it is also occasionally used on puma and bear. The oldest recognized coonhound, it is believed the Black and Tan was developed in the 17th century from Bloodhounds and European Foxhounds, the latter being primarily from a pack kept by the Brooke family. (Most sources state that these dogs were English Foxhounds, although their coloring indicates that they may have in fact been Irish Kerry Beagles.) They are closely related to the American Foxhound, English Coonhound and Bluetick Coonhound.